The Model 156D Stereotactic Mammographic Accreditation Phantom is used for monitoring digital mammography systems currently used for stereotactic biopsy and localization. The phantom is accredited by the ACR, with the added benefit of Gammex Quality Standards achieved over our 30 years of serving the Mammography industry. The Gammex 156D Stereotactic Mammographic Accreditation Phantom is used for monitoring digital mammography systems currently used for stereotactic biopsy and localization. The phantom is accredited by the ACR, with the added benefit of Gammex Quality Standards achieved over our 30 years of serving the Mammography industry. The phantom is 4.4 cm, and is made up of a 7 mm wax insert that contains 12 sets of test objects, with a 3.4 cm acrylic base and a 3 mm cover. Together, this approximates a 4.2 cm compressed breast of 50% glandular and 50% adipose composition. The 5x5 cm wax insert contains simulated microcalcifications in the form of aluminum oxide (Al2O3) specks, four different size nylon fibers to simulate fibrous structures, and four different size lens-shaped masses to simulate tumors. The Gammex 156D phantom will adequately challenge both the digital imaging and stereotactic systems capabilities. Stereotactic Mammographic Accreditation Phantom Model 156D The Gammex 156D Stereotactic Mammographic Accreditation Phantom is used for monitoring digital mammography systems currently used for stereotactic biopsy and localization. The phantom is accredited by the ACR, with the added benefit of Gammex Quality Standards achieved over our 30 years of serving the Mammography industry. The phantom is 4.4 cm, and is made up of a 7 mm wax insert that contains 12 sets of test objects, with a 3.4 cm acrylic base and a 3 mm cover. Together, this approximates a 4.2 cm compressed breast of 50% glandular and 50% adipose composition. 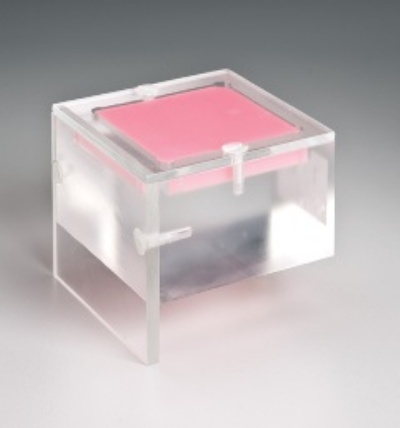 The 5x5 cm wax insert contains simulated microcalcifications in the form of aluminum oxide (Al2O3) specks, four different size nylon fibers to simulate fibrous structures, and four different size lens-shaped masses to simulate tumors. The Gammex 156D phantom will adequately challenge both the digital imaging and stereotactic systems capabilities.